This is the book that shaped the landscape of contemporary science fiction and fantasy. When The Lord of the Rings first appeared, the critics inevitably compared it to this 1922 landmark work. Tolkien himself frankly acknowledged its influence, with warm praise for its imaginative appeal. 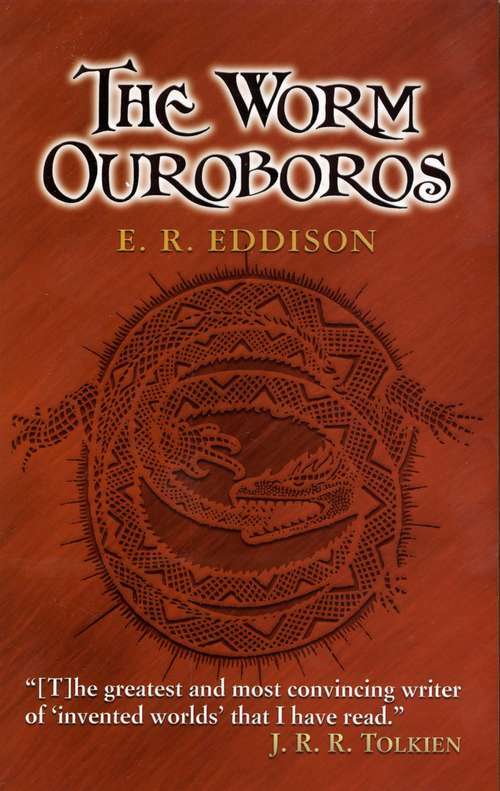 The story of a remote planet's great war between two kingdoms, it ranks as the Iliad of heroic fantasy.In the best traditions of Homeric epics, Norse sagas, and Arthurian myths, author E. R. Eddison weaves a compelling adventure, with a majestic, Shakespearean narrative style. His sweeping tale recounts battles between warriors and witches on fog-shrouded mountaintops and in the ocean's depths — along with romantic interludes, backroom intrigues, and episodes of direst treachery. Generations of readers have joyfully lost themselves in the timeless worlds of The Worm Ouroboros. This new edition, magnificently illustrated with the classic original images, continues the enchantment.